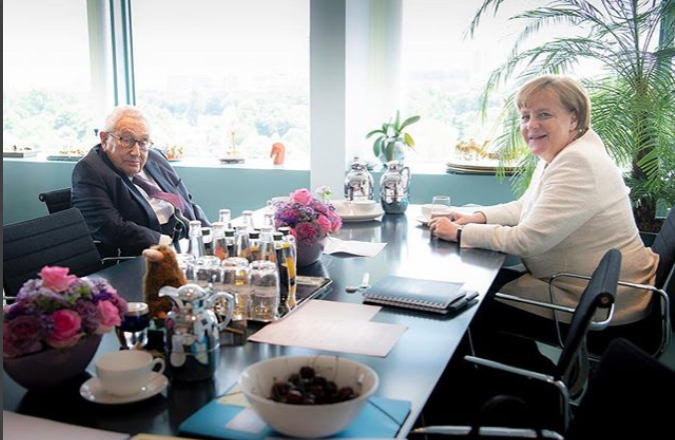 PIC OF THE DAY — German Chancellor Angela Merkel met with Henry Kissinger in Berlin yesterday. HAPPENING TODAY — Attorney General Jeff Sessions is set to keynote the Orthodox Union Advocacy Center annual mission to Washington, DC. Sessions is expected to focus on religious liberty and security for religious schools and synagogues, according to the organizers. Senators Chuck Schumer (D-NY), Ben Cardin (D-MD), Tom Cotton (R-AK) and Ted Cruz (R-TX) will speak at the OU’s luncheon in the Hart Senate Office Building. STATE SIDE — The New York State Senate passed a measure yesterday requiring the State Education Department to review specific school districts’ teaching guidelines and issue regulations necessary to ensure school districts are providing history lessons about the Holocaust. The State Education Commissioner would also be required to deliver a report on findings to the Legislature and the Governor so that all stakeholders can better understand statewide school districts’ aptitude for teaching this type of curriculum.